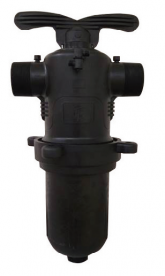 Designed for use as control filters or head filters for irrigation zones. Filter element made of high grade plastic with disc?s in stack form. Inlet/Outlet at 180° flow through design which utilises a direct flow of water along the length of the element. Solid particles can be removed by opening drain valve. Electrostatically oven cured with an epoxypolyester combination. Mesh sizes 80, 120, 150. Maximum operating working pressure 800kPa. Flow Rate : 30000 - 90000 lph. Tavlit’s professional line of plastic fi lters are designed for use in all irrigation systems and industry. Filters are available in sizes from 25mm to 80mm. 90° entry and exit point allows water to flow along the length of filter, water flows through DISCS while solid particles can be removed by opening drain valve. Electrostatically oven cured with an epoxy-polyester combination. Flow Rate : 13000 - 48000 lph.